Discussion in 'Testing Feedback' started by Mepps, Aug 31, 2018. Please use this thread to report bugs and feedback about this year's fall event and its rewards. Is finding Batwoman intended to count once a day? Can appropriate seasonal entries be created for the Warp Menu? The Tides of War event had a Warp Menu entry. I'm not seeing one for the Fall seasonal event. Im hoping theres still time to tweak this but the swarming bat aura as great as it is feels a little lacklustre. Would it at all be possible to double the amount of bats? Seasonal event base items are not placing in base. Hello Shandirra1006, I've attempted to place fall seasonal items in base and they seem to be working. Can you confirm please if you are having this issue with all seasonal base items or a specific base item? I finally figure out where Boo dog is at the 10 second mark. Whenever I try to move the Boo dog around, it is either invisible or keeps teleporting around on me. Thank you Penryn, this was most helpful. I am currently working on a fix that will make Boo Dog visible and stationary during Decoration mode (in his home location). It would be really nice to get an emblem slot on the Headless Jacket. I was surprised to find that it didn't have one. I'm not sure if this is a new thing or not, but while I was looking for Batwoman following a map someone posted, I found these transparent red blocks on the side of the building one block east of Wayne Tech. Any reason we don't have a warp to the respective quest givers this seasonal? That poor Trick-or-Treater is getting shot up and beat by the GCPD cop. During the ghost hunt/save the trick or treaters on seasonal noticed that the spheres into holes action is not counting the saved trick or treaters correctly. For example, I may have to repeat that same action for all three color spheres and it may count all three or none of them. All; floor, ceiling, wall and even Boo Dog. Nothing is allowed. I can see them in Inventory but they will not place. I have tried to rename my bases in an effort to circumvent this but it has not worked. I know this isn’t the place for this, but any chance we can fix TomBot so that he stops having seizures? Good catch. The warp to the seasonal was an awesome QOL adjustment. 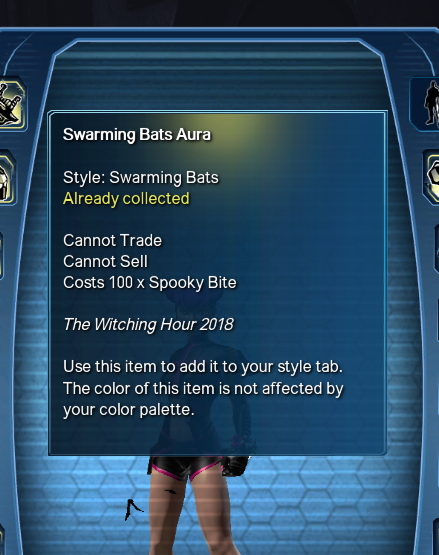 Is the bat aura supposed to be non-tradeable? The other event auras have been tradeable.